Apple made many significant changes to its mobile operating system in its newest version, iOS 6, which came out along with the company’s iPhone 5 launch. iOS 6 hosts more than 200 new features. Google also released its new mobile OS version Android Jelly Bean and was introduced on a number of smartphones. It also hosts a lot of new and improved features. The two OSs have set the stage for a great competition. It is up to you to choose the winner. This article discusses and compares notable features of both OSs. Choose the one that appeals more to you. Apple has maintained the traditional user interface that it uses on its iOS powered devices. iOS 6 only made a few visual changes in its UI. As with its previous versions, the usability of is smooth and easy to navigate. Users of all ages, young and old will be able to operate iOS 6 devices with ease. It retains its earlier charm but according to some people, the iOS interface might have grown old and needs a change. Android Jelly Bean, on the other hand, has made a great improvement since its last version. The OS runs smoothly and the interface is highly customizable. Project Butter takes care of the lagging, which was a common phenomenon in previous Android OSs, although it requires a good processor to work well. Performance on Android Jelly Bean is snappy and the interface is highly customizable. Users can select from a number of home screens. Home screens may also contain various app widgets which are resizable. If you like the old iOS interface and want to stick to it, iOS 6’s added visual features will delight you. However, if you want to enjoy a smooth and snappy Android experience, Jelly Bean should be the choice. iOS 6 has a major advantage of device compatibility over Android Jelly Bean. Apple manufactures build their devices to be fully compatible with their OS. So when Apple released iOS 6, along with the list of compatible devices, they were immediately ready for the upgrade. Google on the other hand, only makes the software and hardware manufacturers like Samsung, HTC, etc., tend to customize the OS to include some of their own features and might not be readily upgradable (except for pure Android devices, like the Google Nexus). If you previously own an Android device, you might have to wait for your manufacturer to announce their support for Jelly Bean. If you want full compatibility and ready updates, iOS 6 has the advantage. iOS 6 sports Siri, your virtual companion which can help you accomplish your daily tasks by simply telling it to. Siri has improved a lot since the last version. Siri can help you get news headlines, keep you up to date with game scores, book seats in a local restaurant, get weather updates and more. Google Now (which comes bundled with Android Jelly Bean) can do all that, but it’s a bit more informative and returns more relevant results. It gets in touch personally, scanning your data and reminding you of upcoming events. When asking for directions, Google Now lists all possible routes to your destination along with probable times.Both Siri and Google Now are great virtual assistants to carry out tasks you assign them. In fact, Siri does a better job at times. But Google Now’s results are more personalized and informative. Its female speaking voice also sounds much more “human” than that of Siri. But then again, Siri has its own charm factor. For more intuitive, informative and personalized results, Jelly Bean’s Google Now is a better option. If you like to “talk” to your phone and assign it regular tasks, Siri will do the job better. Google Maps continues to be one of the most popular navigation apps to be used. Apple, however, was not so successful with its own version of Maps. Both of them have comparable features. Apple as well as Google Maps provides a turn-by-turn navigation. Apple Maps has a cool 3D satellite view, but Google’s little street view is no less impressive. One significant advantage of Google over Apple is the offline availability of the maps. Apple has a lot to improve in its own map version. If you are into travelling and navigation, Jelly Bean and Google Maps should be your choice. Apple has significantly revamped its App Store in iOS 6. With more than 90% of the apps being downloaded every month, Apple App Store features more than 700000 apps. The new UI lets users to browse and search apps easily. Google has also enhanced their Play Store. The new Smart App Updates feature of Google Play lets you to download only updated parts of an app, instead of re-downloading the entire app during an update. 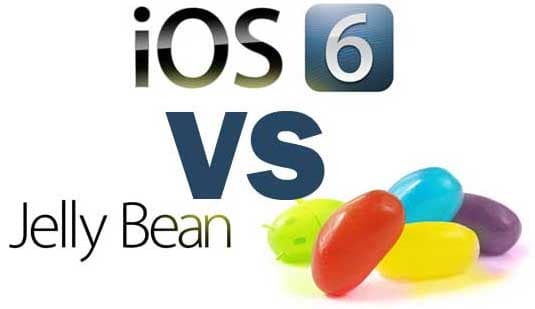 But Apple’s collection of apps and the easy navigation of App Store make iOS 6 a clear choice over Android Jelly Bean. iOS 6 has its own photo sharing feature known as Photo Streams. It is a native iOS 6 app which lets you capture photos and upload them as streams. The photo streams can then be shared among any other iOS devices which have access to your photo streams. Android Jelly Bean has introduced a brand new feature known as the Android Beam. Beam makes it possible to share data among devices which support Near-Field Communication (NFC). The ability to share all kinds of data across multiple devices makes Jelly Bean the choice over iOS 6. Both iOS 6 and Jelly Bean has introduced quite a number of in-call features. In iOS 6, when you reject a call, you can reply the caller instantly with a text message or set a reminder to call back later. In Android Jelly Bean, missed calls automatically go to the Notification Center, where you can either reply the caller via text message or return a call back. There’s no preferable choice here. Pick any one of the Oss and you’ll have good in-call features. Both iOS 6 and Jelly Bean have their own social features. Facebook and Twitter got their native iOS 6 apps, which mean that these apps are well integrated into iOS. You can post your status or view notification outside the apps too (like the lock screen). Android has done its part on keeping up with the social aspect of the OS. Many apps do take advantage of these social aspects. But if you like to spend your time on Facebook and Twitter, iOS 6 will please you! So that’s all with our comparison of two great mobile software giants. Both iOS 6 and Android Jelly Bean are relatively new Oss and need to go a long way in order to become the perfect mobile OS. And as for the ultimate choice, both of them are good in different ways. It all depends on your requirements. So, decide on what you want and go grab your favorite mobile OS.